Netarts Bay is an estuarine bay on the northern Oregon Coast of the U.S. state of Oregon, located about 5 miles (8.0 km) southwest of Tillamook. The unincorporated community of Netarts is located on the north end of the bay and Netarts Bay Shellfish Preserve, managed by Oregon Department of Fish and Wildlife, is located on the south side of the bay. The sand spit on the west side of Netarts bay is part of Cape Lookout State Park. The bay is approximately 5 by 1.5 miles (8.0 by 2.4 km) and totals 2,325 acres (9.41 km2) in area, making it Oregon's seventh largest bay. Of that, 812 acres (3.29 km2) are permanently submerged—the balance of 1,513 acres (6.12 km2) is intertidal land. It experiences a maximum tidal range of 9 feet (3 m). The bay is part of a watershed of 13 square miles (34 km2) that is fed by at least 16 small creeks. From north to south, there is Fall Creek, Hodgdon Creek, O'Hara Creek, Rice Creek, two unnamed creeks, Yager Creek, three unnamed creeks, Whiskey Creek, an unnamed creek, Austin Creek, two unnamed creeks, and Jackson Creek. Like other estuaries along the Oregon Coast, Netarts Bay experiences semi-diurnal tides (two high tides and two low tides per day). At mean low low water (the lower low tide), the bay contains approximately 113 million cubic ft of water. Contrasting that with that a mean higher high tide volume of approximately 450 million cubic feet, the bay's tidal prism is about 33 million cubic feet. The tidal range varies between 1.5 and 3 meters(5 – 9 feet), which can vary the amount of water (40–90%) flushed out of the estuary during each tidal cycle. With a mean tidal period of 745 minutes, bay waters turn over, on average, twice a day. Mixing within the estuary is dependent on local winds and tides. Horizontal mixing is limited, although vertical mixing is strong. Little to no vertical variations in temperature and salinity prevent density-driven current velocities, indicating that Netarts Bay is a well-mixed estuary. This has been further corroborated by water quality and dye studies. Rates of sedimentation average to the bay average nearly 2500 tons annually. An observed 10% decrease in mean high water volume between 1957 and 1969 in conjunction with high sedimentation rates suggests that the bay is gradually filling with sediment over time. LIDAR data have shown the strong erosional response of the Netarts Littoral Cell (a 14-km long stretch of beach tucked between the neighboring Cape Meares and Cape Lookout Headlands) to ENSO (El Niño Southern Oscillation) forcing. During strong El Niño events (e.g. 1997–98), as much as 70,000 cubic meters of sand can be transported. Waves propagating from the southwest erode the southern portion of the spit and transport sediment northward, resulting in northward movement of the bay inlet. This erosion-deposition pattern is amplified by rip currents that create erosional "hot spots" along the spit. Cape Lookout State Park, situated within one of these hotspots, is subject to this intense erosional forcing. Within the last 5 million years, differential erosion patterns on the neighboring Cape Meares and Cape Lookout headlands formed the embayment in which Netarts Bay now sits. Sediment cores obtained from within the bay have provided geological evidence for the existence of large, regularly occurring megathrust earthquakes throughout northwestern Oregon and the larger Cascadia Subduction Zone. Carbon-14 dating of the sediments suggest recurrence rates for these earthquakes to be between 400 and 600 years, and that at least 4 major quakes occurred within the last 3000 years. Sharp sand-layer contacts in the sediment record (deposited by earthquake-generated tsunami waves) indicate post-quake sinking of the marsh. This phenomenon, known as coseismic subsidence, provides strong geological evidence for the regular occurrence of major earthquakes occurring within the Cascadia Subduction Zone. Remnants of fire hearths from Native American settlements along nearby Nehalem and Salmon Rivers provide additional evidence of land subsidence (1–2 meters) resultant from subduction-zone earthquakes. Olympia oysters are the only native oyster to the West Coast of North America. The establishment of a commercial fishery in the 1860s confirms a historical population within Netarts bay, with evidence of harvesting along the West Coast of North America by humans going back 4000 years. Due to over harvesting, increased consumption, and the export of adult oysters to San Francisco Bay, oyster populations declined in the late 1800s and the commercial fishery collapsed. The last known naturally occurring population of Olympia oysters in Netarts was surveyed in 1954. Subsequent field surveys in 1979 and 1992 did not find any Olympia oysters within the bay. Potential factors preventing population recovery post fishery collapse include: habitat degradation, sedimentation by increased motorized boat use, suffocation by burrowing shrimp, pollution, predation by invasive Japanese oyster drill and parasitism by non-native flat worm After their 1992 survey, Oregon Department of Fish and Wildlife began a large scale restoration attempt in Netarts, setting out 9 million spat between 1993-1998. Olympia oyster populations did not return to historical levels, but surveys in 2004 detected low populations of transplanted oysters in the bay. Anecdotal observations from residents also suggest small pockets of naturally occurring oysters subsist in the southwest corner of the bay. Juvenile oysters planted on adult oyster shell as substrate demonstrated that Olympia oysters can grow and reproduce in the bay. Small scale, investigative restoration projects run by The Nature Conservancy were undertaken in 2005 and 2006 to rebuild populations of Olympia oysters in Netarts Bay by adding shell cultch with set Olympia oysters to the bay in hopes of increasing settlement substrate and broodstock. Early monitoring of these sites found reproductive tissue and brooded larvae in adults and recruitment of larvae on shell substrate, but monitoring of the site ceased in 2007. Restoration interests are driven by culinary interest in Olympia oysters, the potential economic benefits of a commercial fishery, and the significant ecosystem services that Olympia oysters provide, including filtering the water and providing substrate for other organisms. Four species of bay clam are also found in Netarts Bay. The main primary producers of the bay are eelgrass (Zostera marina, a type of seagrass), microscopic diatoms, and sea lettuce (Ulva enteromorpha, a type of macroalgae). Most of these species are found on mudflats, which account for about two-thirds of the total area of Netarts Bay. Eelgrass beds are found in the intertidal and subtidal mudflats, and biologically interact with oyster beds in a few ways: The pseudofeces and feces of bivalves have been found to fertilize seagrass by increasing bioavailable macronutrients such as ammonium and phosphate in sediments. Bivalves also filter phytoplankton from the water column, a process which reduces water turbidity, allows more light to penetrate through the water column, and reduces the number of epiphytes living on seagrass leaves. Eelgrass is important as food for waterfowl, habitat for juvenile fish, and as physical shapers of the bay. The growing season is from April to October. Diatoms are found in benthic and pelagic environments of the bay, and also as epiphytes living on other marine plants. There is a total of 336 diatom taxa identified in the bay, 50 of which are planktonic, 123 of which are epiphytic, and 282 of which are benthic (about 111 taxa overlap the epiphytic and benthic categories). Benthic diatom assemblage distributions correspond to sediment type, grain size, and wave energy. Sea lettuce, a macroalgae otherwise known as green nori, grows usually only in the summer. Seasonal upwelling along the Pacific North American coast has been correlated to increased sea lettuce productivity and decreased eelgrass productivity. Japanese eelgrass (Zostera japonica) is an introduced species found in bays and estuaries ranging from Oregon to British Columbia, Canada. It was likely brought over by Pacific oyster seed shipments that began in the early 20th century used by commercial shellfisheries along the Pacific northwest coast. Netarts Bay and sand spit are within the historic territory of the Tillamook Indians, which ranged from Tillamook head in the north to the Nestucca River in the south and from the Pacific Ocean in the west to the Coast Range summit in the east. 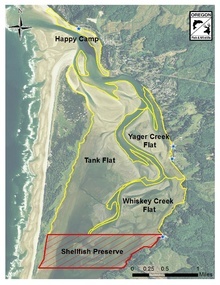 Cape Lookout State Park contains 13 suspected archaeological sites, including 6 on Netarts sand spit representing at least one and perhaps up to three major villages. Archaeological excavations of Netarts Sandspit Village (35-TI-1) show evidence of a major Tillamook village that was occupied at least three separate times between 1300–1700 A.D. Excavations revealed semisubterranean cedar plank structures with single pitched roofs, numerous hearths and fire pits, and middens around all house pits. The village contained at least 13 house pits and may have contained up to 30–40 house pits. It has been described as "the most impressive house pit site on State Park lands along the Oregon Coast." Numerous artifacts were found during excavation of 35-Ti-1 in the 1950s. Some of the bone and antler objects found include: wedges, adzes, awls, needles, bi-pointed pins, blades, harpoon barbs, chisels, digging stick handles, and bone carvings with faces, perhaps from clubs or wand handles. One house pit included whalebone objects including a 1.5m x 0.3m (~5 ft x 1 ft) seat and a possible whale vertebrae seat surrounded by fire pits. Numerous stone artifacts were also found at the site, including: projectile points, blades, scrapers, gravers, core choppers, modified flakes, double pitted cobbles, hammerstones, and whetstones. The most recent occupation layer also contained trade goods including: rusted iron (perhaps knife blades), a copper pendant, and many sherds of Chinese porcelain. Closer examination of the middens surrounding major house pits identified middens that were up to 1.3m deep, and in some cases over 2m deep. Over 67,000 vertebrate specimens, in total, of at least 59 species have been recovered from test pits at the site including bones from birds, fish, shellfish, sea lions, sea otters, seals, porpoises, whales, elk, deer, and beavers. Initial attempts to describe midden composition determined a rough 50:50 split between shells of blue clams and cockles, with butter clams and bent-nosed clams making up the rest. However, future investigations found over 14,000 Dungeness crab fragments in roughly 4m3 of excavated midden sediment. It was determined that Native Americans harvested a large size range of Dungeness crabs, including many juvenile crabs, from the bay. It is suspected crabs were collected along with cockles using a rake-like tool during low tide. It seems all major shellfish species found in the middens could be harvested throughout the course of a tidal cycle. It is suspected that contact between Europeans and Indians became more numerous and consistent in the late 1700s. By the time Lewis & Clark arrived in 1806, Indians had firearms and metal implements. The first European settlers arrived in Netarts Bay in 1865, and records suggest native Olympia oysters were abundant in the bay. In fact, there are indications oyster harvests by European settlers began as early as 1868 and that at least some of these oysters were exported to San Francisco. Historic accounts indicate a shanty town, named Oysterville, was present in the bay during this time, and the bay was sometimes called "Oyster Bay." By 1903 virtually all shore line of the spit was claimed and occupied. Despite early claims, residential use of Netarts sand spit had mostly disappeared by 1920 and subsequent growth concentrated in Netarts along the northeast bay. A commercial oyster cultivating industry was present from 1930-1957; however, the accidental introduction of the Japanese oyster drill led to the collapse of this industry in 1957. The oyster industry along the West Coast of North America relies almost exclusively on the Pacific Oyster, Crassostrea gigas. There are only three locations on the West Coast of North America where natural recruitment of C. gigas takes place: Willapa Bay, WA, Hood Canal WA, and British Columbia, Canada. Recruitment elsewhere is limited by cold water temperatures that inhibit spawning and low residence time of water that flushes out larvae, making the oyster industry dependent on hatcheries to raise larvae. Whiskey Creek Shellfish Hatchery, located in Netarts Bay, is one of the largest providers of larvae for the industry. In the late summer of 2007, the hatchery saw massive die offs in larvae, resulting in zero production for multiple months on end. Similar die offs and production failures occurred at other Pacific Northwest hatcheries and oyster farms. Water samples from Whiskey Creek Shellfish Hatchery tested positive for a bacteria, Vibrio tubiashii, and this pathogen was suspected to be the cause of the mortality. However, after installing a new system to clean the water, another round of die-offs occurred. Oyster at Whiskey Creek Shellfish Hatchery. Photo by Oregon State University. Researchers from Oregon State University and Hatchery employees were able to work together to make the connection between early larval mortality and upwelling conditions that negatively impacted the entire west coast shellfish industry. Using Hatchery records of larval performance and monitoring of incoming tidal water from Netarts Bay, low aragonite saturation states at the time of spawning were correlated with the high levels of larval mortality that heavily reduced hatchery production and negatively impacted the west coast oyster industry Further research from OSU, supported by Whiskey Creek, helped to identify the first 48 hours of larval life, in which the initial shell is built, as a window of vulnerability to ocean acidification due to the rapid rate of calcification and limited energetic budget. Experiments decoupling PCO2, pH demonstrated that aragonite saturation has the greatest impact on shell development of early bivalve larvae. These conclusions supported buffering of incoming water and chemical monitoring approach used by Whiskey Creek Hatchery to improve survival of larval oysters. Research at Whiskey Creek Hatchery contributed to the body of knowledge around ocean acidification and the immediate impacts it has on calcifying organisms. Real-time water quality monitoring systems now exist to help shellfish farmers, scientists, and others invested in oyster aquaculture track changes in aragonite saturation state, pCO2 and pH. An online portal with this information was funded by the U.S. Integrated Ocean Observing System (IOOS), and regional ocean observing systems continuously contribute to the data stream. One such regional system, the Northwest Association of Networked Ocean Observing Systems (NANOOS), aims to develop predictive data products for use by local and national stakeholders in shellfish aquaculture, as well as the general public. Water quality data are provided by analytical gas monitoring systems known as "burkolators," named for the OSU researcher who invented them, Dr. Burke Hales. Burkolators resolve PCO2 and TCO2 (total dissolved carbon dioxide) measurements within water samples at high spatial resolution, allowing for accurate calculations of total alkalinity. Initially implemented as a scientific tool, burkolators are now used at 5 shellfish hatcheries along the U.S. West Coast to monitor incoming water quality. Live feeds of burkolator data at the hatcheries can be found on the NANOOS website. Most shellfish growers have observed effects of ocean acidification on their businesses. In a survey of 86 shellfish growers located in California, Oregon, and Washington, 85% identified ocean acidification as a problem affecting them today, and 95% identified ocean acidification as a problem that will affect future generations. Bivalve larvae are generally more susceptible than adult bivalves to decreased pH and saturation states, so early stages of oyster seeding may be more vulnerable the bioenergetic stress of ocean acidification. Spatial and temporal variations in ocean chemistry require continual adaptation, and shellfish growers are subject to greater uncertainty in the face of climate change. ^ a b c d "SEACOR – Findings, Netarts". Oregon Department of Fish & Wildlife. ^ a b c Advisory Committee to the State Land Board (July 1972). "An Inventory of Filled Lands in Netarts Bay Estuary" (pdf). Oregon State University Scholars Archive. p. 2. Retrieved 2008-07-25. ^ "ACME Mapper 2.1". mapper.acme.com. Retrieved 2017-02-24. ^ a b c d Davis, M.; McIntire, C. (1983). "Effects of physical gradients on the production dynamics of sediment-associated algae". Marine Ecology Progress Series. Oldendorf. 13 (2–3): 103–114. doi:10.3354/meps013103. ^ a b c d Glanzman, C., Glenne, Bard, Burgess, Fred, & Oregon State University. Engineering Experiment Station. (1971). Tidal hydraulics, flushing characteristics and water quality in Netarts Bay, Oregon : Final report. Corvallis, Or. : Engineering Experiment Station, Oregon State University. ^ Dicken, S., Hanneson, Bill, & Johannessen, Carl L. (1961). Some recent physical changes of the Oregon coast. Eugene: Dept. of Geography, University of Oregon. ^ Revell, D., Komar, P., & Sallenger, A. (2001). Application of LIDAR to erosion hotspots in the netarts littoral cell, Oregon. Illumina Conference Papers Index - Unstructured, Illumina Conference Papers Index - unstructured. ^ a b Komar, P (2002). "An Application of LIDAR to Analyses of El Niño Erosion in the Netarts Littoral Cell, Oregon". Journal of Coastal Research. 18 (4): 792–801. ^ "Cascadia Subduction Zone | Pacific Northwest Seismic Network". Pacific Northwest Seismic Network. Retrieved 2017-03-01. ^ Hawkes, Andrea D.; Scott, David B.; Lipps, Jere H.; Combellick, Rod (2005). "Evidence for possible precursor events of megathrust earthquakes on the west coast of North America". Geological Society of America Bulletin. 117 (7): 996. doi:10.1130/b25455.1. ^ Atwater, Brian F.; Nelson, Alan R.; Clague, John J.; Carver, Gary A.; Yamaguchi, David K.; Bobrowsky, Peter T.; Bourgeois, Joanne; Darienzo, Mark E.; Grant, Wendy C. (2012-07-31). "Summary of Coastal Geologic Evidence for Past Great Earthquakes at the Cascadia Subduction Zone". Earthquake Spectra. 11 (1): 1–18. doi:10.1193/1.1585800. ^ Long, A.; Shennan, I. (1998). "Models of rapid relative sea-level change in Washington and Oregon, USA". Holocene. 8 (2): 129–142. doi:10.1191/095968398666306493. ^ a b c d e Minor, Rick; Grant, Wendy C. (1996). "Earthquake-Induced Subsidence and Burial of Late Holocene Archaeological Sites, Northern Oregon Coast". American Antiquity. 61 (4): 772–781. doi:10.2307/282017. JSTOR 282017. ^ a b c d Groth, Scott; Rumrill, Steve (2009-03-01). "History of Olympia Oysters (Ostrea lurida Carpenter 1864) in Oregon Estuaries, and a Description of Recovering Populations in Coos Bay". Journal of Shellfish Research. 28 (1): 51–58. doi:10.2983/035.028.0111. ISSN 0730-8000. ^ "Books in Review". Gastronomica. 2 (2): 103–117. 2002-01-01. doi:10.1525/gfc.2002.2.2.103. JSTOR 10.1525/gfc.2002.2.2.103. ^ Kirby, Michael Xavier (2004-08-31). "Fishing down the coast: Historical expansion and collapse of oyster fisheries along continental margins". Proceedings of the National Academy of Sciences of the United States of America. 101 (35): 13096–13099. doi:10.1073/pnas.0405150101. ISSN 0027-8424. PMC 516522. PMID 15326294. ^ D., Marriage, Lowell (1958-01-01). "The Bay Clams of Oregon: Their Identification, Relative Abundance, and Distribution". hdl:1957/59730. ^ Trimble, Alan C.; Ruesink, Jennifer L.; Dumbauld, Brett R. (2009-03-01). "Factors Preventing the Recovery of a Historically Overexploited Shellfish Species, Ostrea lurida Carpenter 1864". Journal of Shellfish Research. 28 (1): 97–106. doi:10.2983/035.028.0116. ISSN 0730-8000. ^ a b c d e f "Re‐establishment of the native oyster, Ostrea conchaphila, in Netarts Bay, Oregon, USA". 2008-08-06. hdl:1957/9542. ^ a b c McIntire, C.D., Davis, M.W., Kentula, M.E., Whiting, M. (1983). Benthic Autotrophy in Netarts Bay, Oregon. Report prepared for Environmental Protection Agency, Corvallis, OR, USA. ^ a b Peterson, B.; Heck Jr, K.L. (2001). "Positive interactions between suspension-feeding bivalves and seagrass – a facultative mutualism". Marine Ecology Progress Series. 213: 143–55. doi:10.3354/meps213143. ^ Tallis, H.M.; Ruesink, J.L. ; Dumbauld, B.; Hacker, S.; Wisehart, L.M. (2009). "Oysters and aquaculture affect eelgrass density and productivity in a pacific northwest estuary". Journal of Shellfish Research. 28 (2): 251–61. doi:10.2983/035.028.0207. ^ a b Stout, H. (1976). The natural resources and human utilization of Netarts Bay, Oregon. Corvallis: Oregon State University. ^ Hessing-Lewis, M. L.; Hacker, S. D. (2013). "Upwelling-influence, macroalgal blooms, and seagrass production; temporal trends from latitudinal and local scales in northeast Pacific estuaries". Limnology & Oceanography. 58 (3): 1103–12. doi:10.4319/lo.2013.58.3.1103. ^ Shafer, D. J.; Kaldy, J. E.; Gaeckle, J. L. (2014). "Science and management of the introduced seagrass Zostera japonica in North America". Environmental Management. 53 (1): 147–62. doi:10.1007/s00267-013-0172-z. PMID 24100942. ^ Harrison, P. G.; Bigley, R. E. (1982). "The recent introduction of the seagrass Zostera japonica Aschers. and Graebn. to the Pacific Coast of North America". Canadian Journal of Fisheries and Aquatic Sciences. 39 (12): 1642–8. doi:10.1139/f82-221. ^ a b c d Bonacker, G., Martin, Robert C., Frenkel, Robert E., & Oregon. Natural Area Preserves Advisory Committee. (1979). Preserve analysis : Netarts Sand Spit. Salem, Or. : Oregon Natural Area Preserves Advisory Committee. ^ a b c d e f g h i j k Newman, T. (1959). Tillamook prehistory and its relation to the Northwest coast culture area. University of Oregon. ^ a b c Losey, Robert (2005). "House Remains at the Netarts Sandspit Village, Oregon". Journal of Field Archaeology. 30 (4): 401–417. doi:10.1179/009346905791072215. ^ a b c d e Losey, Yamada; Largaespada (2004). "Late-Holocene Dungeness crab ( Cancer magister) harvest at an Oregon coast estuary". Journal of Archaeological Science. 31 (11): 1603–1612. doi:10.1016/j.jas.2004.04.002. ^ a b c d Shabica, S. et al. 1976. The natural resources and human utilization of Netarts Bay, Oregon. (An interdisciplinary student -originated study funded by the NSF under Grant No. EPP 75- 08901). Oregon State Univ., Corvallis. ^ a b Ruesink, Jennifer L.; Lenihan, Hunter S.; Trimble, Alan C.; Heiman, Kimberly W.; Micheli, Fiorenza; Byers, James E.; Kay, Matthew C. (2005-11-10). "Introduction of Non-Native Oysters: Ecosystem Effects and Restoration Implications". Annual Review of Ecology, Evolution, and Systematics. 36: 643–689. doi:10.1146/annurev.ecolsys.36.102003.152638. ^ Banas, N. S.; Hickey, B. M.; Newton, J. A.; Ruesink, J. L. (2007-07-04). "Tidal exchange, bivalve grazing, and patterns of primary production in Willapa Bay, Washington, USA". Marine Ecology Progress Series. 341: 123–139. doi:10.3354/meps341123. ^ "The great oyster crash". Grist. 2011-08-18. Retrieved 2017-03-22. ^ "Cracking the Case of the Vanishing Oyster Larvae". Great American Adaptation Road Trip. 2013-09-04. Retrieved 2017-03-22. ^ "Oysters in deep trouble: Is Pacific Ocean's chemistry killing sea life?". The Seattle Times. 2009-06-14. Retrieved 2017-03-22. ^ "Oysters dying as coast is hit hard | Sea Change | The Seattle Times". The Seattle Times. Retrieved 2017-03-22. ^ a b c d Barton, Alan; Hales, Burke; Waldbusser, George G.; Langdon, Chris; Feely, Richard A. (2012-05-01). "The Pacific oyster, Crassostrea gigas, shows negative correlation to naturally elevated carbon dioxide levels: Implications for near-term ocean acidification effects". Limnology and Oceanography. 57 (3): 698–710. doi:10.4319/lo.2012.57.3.0698. ISSN 1939-5590. ^ a b Barton, Alan; Hatchery, Whiskey Creek Shellfish; Waldbusser, George; Feely, Richard; Weisberg, Stephen; Newton, Jan; Hales, Burke; Cudd, Sue; Eudeline, Benoit (2015). "Impacts of Coastal Acidification on the Pacific Northwest Shellfish Industry and Adaptation Strategies Implemented in Response". Oceanography. 25 (2): 146–159. doi:10.5670/oceanog.2015.38. ^ Waldbusser, George G.; Brunner, Elizabeth L.; Haley, Brian A.; Hales, Burke; Langdon, Christopher J.; Prahl, Frederick G. (2013-05-28). "A developmental and energetic basis linking larval oyster shell formation to acidification sensitivity". Geophysical Research Letters. 40 (10): 2171–2176. doi:10.1002/grl.50449. ISSN 1944-8007. ^ a b Waldbusser, George G.; Hales, Burke; Langdon, Chris J.; Haley, Brian A.; Schrader, Paul; Brunner, Elizabeth L.; Gray, Matthew W.; Miller, Cale A.; Gimenez, Iria (2015-06-10). "Ocean Acidification Has Multiple Modes of Action on Bivalve Larvae". PLOS ONE. 10 (6): e0128376. doi:10.1371/journal.pone.0128376. ISSN 1932-6203. PMC 4465621. PMID 26061095. ^ a b "NOAA, partners provide real-time ocean acidification data to Pacific coast shellfish growers". www.noaanews.noaa.gov. Retrieved 2017-03-10. ^ "IPACOA : Home". www2.ipacoa.org. Retrieved 2017-03-15. ^ "NANOOS". www.nanoos.org. Retrieved 2017-03-15. ^ "NVS : Disclaimer". nvs.nanoos.org. Retrieved 2017-03-10. ^ Bandstra, Leah; Hales, Burke; Takahashi, Taro (2006-06-01). "High-frequency measurements of total CO2: Method development and first oceanographic observations". Marine Chemistry. 100 (1–2): 24–38. doi:10.1016/j.marchem.2005.10.009. ^ "NVS : Shellfish Growers". nvs.nanoos.org. Retrieved 2017-03-15. ^ Mabardy, R. A., Conway, F. D. L., Waldbusser, G. G., Olsen, C. S. (2016). & Oregon State University. Sea Grant College Program, issuing body. (2016). The U.S. West Coast Shellfish Industry's Perception of and Response to Ocean Acidification: Understanding an ocean stakeholder (ORESU-S ; 16-001). Corvallis, Oregon: Oregon Sea Grant. ^ Kroeker, Kristy J.; Kordas, Rebecca L.; Crim, Ryan; Hendriks, Iris E.; Ramajo, Laura; Singh, Gerald S.; Duarte, Carlos M.; Gattuso, Jean-Pierre (2013-06-01). "Impacts of ocean acidification on marine organisms: quantifying sensitivities and interaction with warming". Global Change Biology. 19 (6): 1884–1896. doi:10.1111/gcb.12179. ISSN 1365-2486. PMC 3664023. PMID 23505245. This page was last edited on 5 February 2019, at 07:22 (UTC).